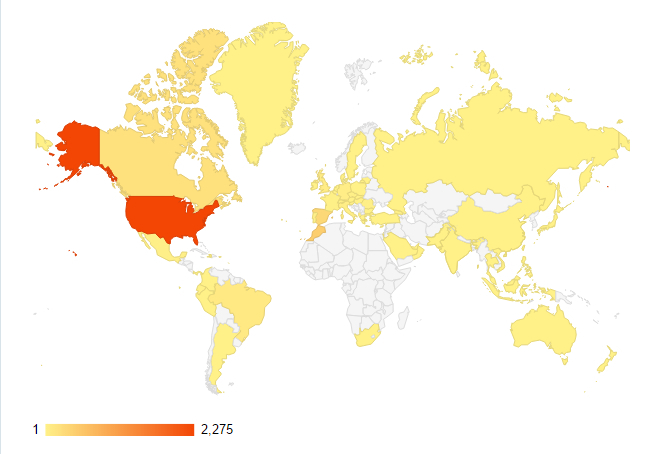 I was poking around the background of our blog/website and started looking at statistics. It was amazing to see we’ve had more than 7,000 views and more than 2,600 unique visitors since we began this project back in September, 2014. Plus, we totally rocked it on July 18th, apparently. As you can see on the right, the United States is strongly represented, by family and friends I imagine, as is Canada and Spain. We’ve made all sorts of new friends in Morocco, so their numbers are high as well. But, who knew we’d be so popular in Brazil? Go figure. Also, aside from central Africa, which speaks volumes about inherent inequities, it looks like we’ve been seen by someone in nearly every country in the world. That’s pretty cool. Anyway, thanks for the continued support. Knowing folks are reading our words, seeing our pictures, and tolerating our musings makes it all the more motivating. Please, if there are questions or topics you would like us to address, go to the About Us page and send us an email. We’ll do our best to respond. How great is that! You are truly international. And I bet that there are fans out there who aren’t friends and family.